Next to receive coats were preschool and elementary school students in North Chicago, where Rotarians delivered coats in December. 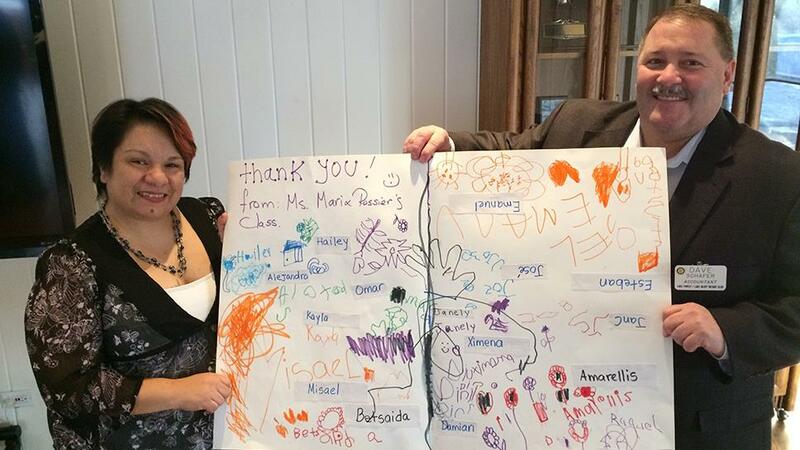 On January 6 Angela Ramirez (pictured, with Dave Schafer), Parent Engagement and ELL Data Specialist for the North Chicago School District, attended a meeting of the Lake Forest-Lake Bluff Rotary Club to personally deliver the festively decorated thank-you notes, cards, and posters the children made. Kevin Stevens of the North Chicago Rotary Club also attended and presented a check for $1,000 from his club as a donation to the coat fund. The Rotary Club works with Operation Warm, Inc., a non-profit charitable organization that distributes high-quality, new winter coats to children living in need. The Rotary Club acquires coats at wholesale-like prices – less than $20 per coat – from Operation Warm’s inventory. In the past seven years, the Lake Forest-Lake Bluff Rotary Club has distributed over 3,200 new winter coats to children in need in local communities. Tax-deductible donations to the Rotary Club’s Operation Warm coat fund can be made at any time of the year at www.lflbrotary.org or by contacting David Schafer at 847-234-5000, ext. 5410. General tax-deductible donations to the club’s foundation are also appreciated to help support the club’s other charitable activities. The Lake Forest-Lake Bluff Rotary Club meets Wednesday mornings at 7:15 at the Lake Forest Club for breakfast and a guest speaker. Membership is open to service-oriented residents and workers in the area. Guests are welcome to attend. Rotary brings leaders together to exchange ideas and take action to solve problems in our community and the world. Club projects include local, national, and international humanitarian projects. To learn more about the club and its programs, visit www.lflbrotary.org.